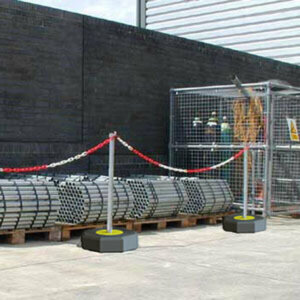 Kee Mark is a cost-effective freestanding demarcation system that uses galvanised steel uprights, sturdy PVC bases and a high-vis plastic safety chain. 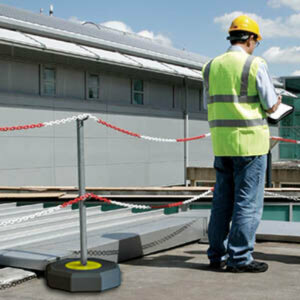 It is a non-fall arrest product that complies with the HSE guidance note HSG 33 Health and Safety in Roof work. 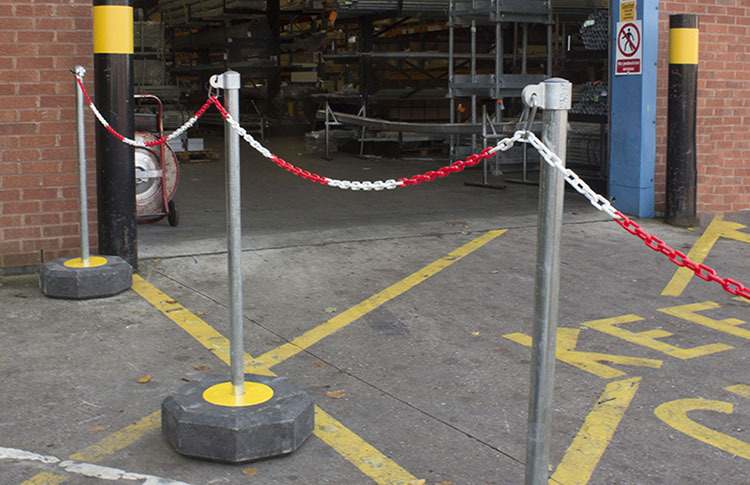 Compact, portable and easy to install, the barrier features a two-colour high vis chain which is attached to the uprights using a karabiner. This ensures that the chain is not blown away by strong winds for example. 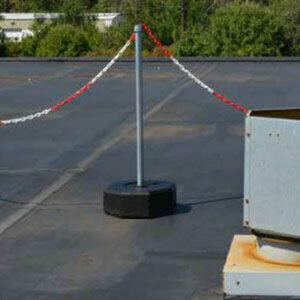 Demarcation is often required around a specific piece of plant/equipment in the centre of a large roof. 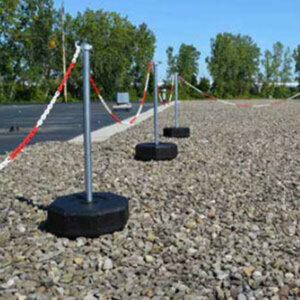 As long as it is set 2m away from the roof edge, demarcation systems can be successfully used instead of edge protection solutions. 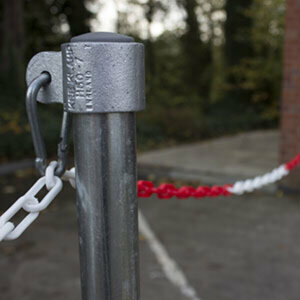 Demarcation can also be used at ground level for trade shows for example, machinery demarcation and queue management. 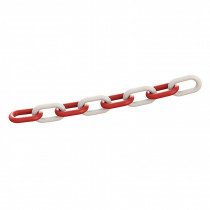 A plastic chain that is part of the Kee Mark demarcation system. 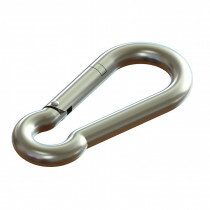 A steel karabiner used for linking chains in a demarcation system. A Kee Mark unit made of a PVC base, a single hook upright, an M50 fitting and a karabiner. A Kee Mark unit made of a PVC base, a single hook upright, two M50 fittings and two karabiners. Allows for 2 rows of chain. 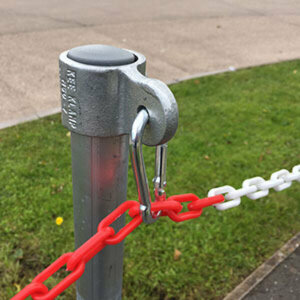 Kee Mark uses a two-colour chain (red and white), which makes the system visible to everyone on site. The dual uprights allow for 2 rows of chains for extra visibility. Our system is modular, which means that you can easily design and install it on any site, whether indoors or outdoors. No specialist tools needed, no welding, no skilled labour. The 25kg base weight reduces the risk of the system falling over during high winds, removing the need for any additional ballast. Kee Mark is also highly resistant in any kind of weather. 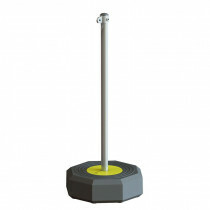 Kee Mark does not require any drilling onto the surface as it uses 25 kg base weights. This means that you can easily dismantle the unit and reassemble it somewhere else. 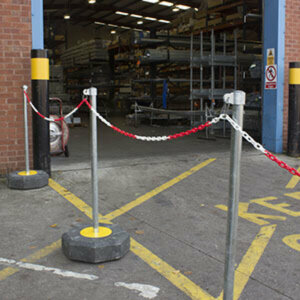 Install the posts 3m apart, with the chain linked to form a continuous demarcation route. Installation is possible within minutes. In many cases, demarcation is required around a specific piece of plant or equipment, in the centre of a large roof. This is where the demarcation system can be used in place of edge protection solutions, providing the demarcation is set at least 2m from the roof edge. 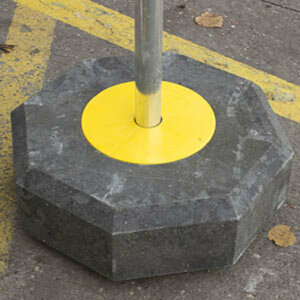 Kee Mark can equally be used at ground level for alternative types of demarcation such as trade shows, machinery demarcation and queue management. 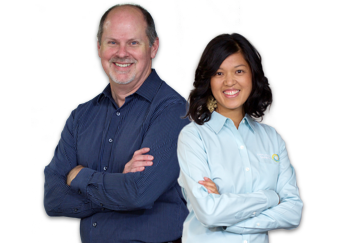 Our experts will help you select the items you need to complete the project.